Q Acoustics Concept 500 review | What Hi-Fi? The Q Acoustics brand has been a major success story. The company is barely a decade old, but in that time it has delivered a series of class-leading and affordable products that have garnered plenty of What Hi-Fi? Awards. But it seems that is no longer sufficient - the brand is targeting an expansion into the high-end market. The Concept 500 floorstanders are its initial weapon of choice. 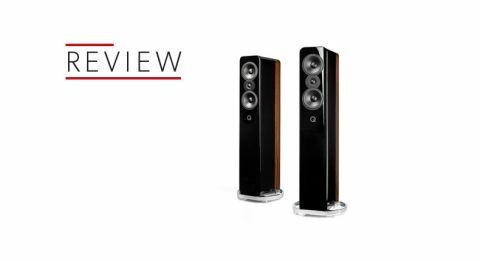 This isn’t the first time the company has ventured to premium price levels – it introduced the £1000 Concept 40 floorstanders a few years ago – but these Concept 500s are the most ambitious attempt yet to move upmarket. Don’t let their familiar aesthetic fool you. While they undeniably build on the brand’s existing technologies, these speakers also take numerous steps forward in a bid to justify their premium price. That 115cm tall cabinet retains the brand’s distinctive visual identity, but adds a neat wood veneer strip along the sides for an extra touch of luxury. It’s a sturdy box, as you’d expect, but here Q Acoustics uses no less than three layers of MDF separated by a soft decoupling material called Gelcore. It’s a technique the company has used in its existing Concept models and really does help reduce the cabinet’s contribution to the overall sound. Any vibration transmitted through the wooden layers is absorbed and turned into heat, but the enclosure doesn’t warm to the touch during use, even at party levels. The whole structure is strategically braced too, reducing vibration without transmitting unwanted mechanical energy to other parts of the cabinet where it can degrade performance. The drive units may not appear unusual on paper – the twin 16.5cm mid/bass drivers use treated paper cones and the tweeter is a conventional soft dome design – but there has been plenty of engineering effort expended on the details of suspension, motor system, diaphragm profiles, material and drive unit mounting to extract the most from these ingredients. The same can be said of the crossover design and the components used in it. The Concept 500s prove relatively unfussy in positioning. We keep them well away from the rear and sidewalls of our medium-sized listening room, and angle them in a touch towards the listening position. It isn’t hard to find a position where the frequency range sounds balanced and the stereo imaging proves convincing. Despite that, the engineers have developed a system to alter the tweeter output level – using a moveable link – to help fine-tune performance. We end up with the link set to the neutral position, but can imagine the adjustment being useful in certain circumstances. We’ve long felt Q Acoustics products have tended to be pretty forgiving of partnering equipment and source material quality. That proves the case here - the speaker’s excellent refinement and smooth delivery refuses to make a meal of poorer, more aggressive inputs. That’s not to say these speakers don’t need anything better to shine. The downside of the Concept 500’s aggressive pricing – remember we’re talking high-end standards where £4000 is considered entry-level – is there’s a strong likelihood they be partnered with similarly priced sources and amplification. That’s a shame because, while we’re sure they’ll sound more than acceptable with such electronics, we know these speakers are capable of so much more. Put them on the end of something more ambitious – we used our reference set-up of Naim NDS/555PS streamer and Gamut D3i/D200i pre/power amplification – and they’re capable of a performance that puts most rivals to shame and strongly challenges alternatives up to twice their price. Hyperbole? All any doubters need to do is have a careful listen to a properly set-up pair on the end of some capable electronics. We’re sure they’ll be as convinced as we are. It doesn’t matter what type of music you play. Stravinsky’s The Rite of Spring shows off the 500s' wide-ranging dynamics and ability to handle a multitude of instrumental strands without losing cohesion or the overall musical message. There’s so much detail on offer, and it’s organised with care and composure. Low-level nuances aren’t overshadowed and, equally, sounds meant to dominate do so with confidence. Pleasingly, this is not a product that emphasises the leading edge of notes just to appear impressive. The Concept 500s are more mature than that. They sound welcoming and easy-going without losing the excitement in the music. Their full-bodied tonal balance has plenty in the way of richness and weight but balances this with a fine sense of agility when the music requires. The 500s' stereo imaging is good for speakers of this type – the elaborate cabinet construction making itself heard in the way they project the sound as much as in the undeniable dynamic benefits it offers. Massive Attack’s Angel has long been a favourite test track and these floorstanders take its juggernaut of a bassline in stride. We love the way they render bass – it’s properly deep and powerful, but tuneful with it. We’re surprised a pair of 16.5cm drivers can dig so deep so convincingly. Vocals are delivered with clarity and finesse. There’s no shortage of dynamic subtlety here, or transparency. This talent through the midrange points to well-designed drive units and crossovers, as well as a properly designed cabinet. We listen to everything from the stadium rock of Bruce Springsteen and folk of The Unthanks, all the way through to the large-scale sonic pyrotechnics of Hans Zimmer’s Gladiator OST and these Q Acoustics handle it unfussily. They sound comfortable and composed regardless of volume level or musical complexity. Importantly, their broad skill-set means they simply don’t intrude on the musical experience. All pieces of hi-fi, particularly speakers, add a bit of character to the presentation, but it’s very easy to accept the 500s' version of the truth. We think these are among the most impressive high-end speakers we’ve heard in recent years. If they had been made by an established high-end brand rather than one trying to crash the party, we suspect the price would have been thousands higher. Recommended? You bet.